Christmas Surprises to Celebrate! Christmas Love-Child Unworldly secretary Grace was swept into the sumptuous world of Prince Maksim Rostov, who took her innocence for a business deal! 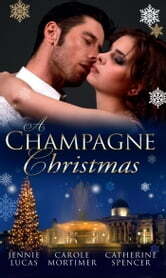 The ruthless Russian discovers Grace’s pregnancy and takes her to his mansion in Moscow. She’ll be his captive bride and princess… A White Christmas It was a white Christmas when Meg crashed her car and was forced to seek the kindness of a stranger, novelist Jed Cole. He clearly wasn’t happy to have Meg and her little boy foisted upon him. But they shared a white-hot attraction and Christmas together… Italian Billionaire’s Miracle Arlene Russell may be naive and vulnerable, but she refuses to become arrogant Italian Domenico Silvaggio d'Avalos' mistress. She won't be bought! But Domenico is determined to make Arlene his convenient bride. Especially when she gives him a special Christmas gift!